If the ball when re-dropped rolls into any position listed above, it must be placed as near as possible to the spot where it first struck a part of the course when re-dropped. My understanding is that the reason that he “took a few goes” is that more than one drop landed outside the tiny patch that he was aiming for within the permitted area, which meant that it did not count towards the drop. There were two valid drops that were within the permitted area, but the ball rolled to a position where there was either interference from the path, or was nearer to the hole, the second of which then became the reference point where he was permitted to place the ball. Because of the accuracy of this valid re-drop he was able to place his ball sitting up on a nice little tuft of grass, almost like a tee, because this is where the ball first hit the course before rolling away. 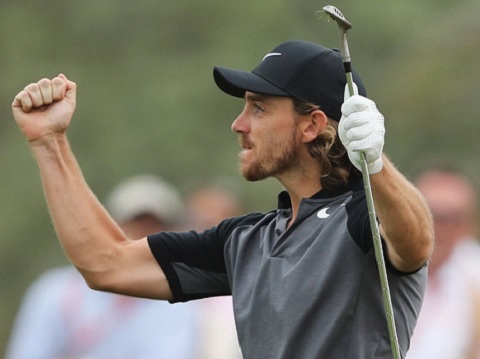 He then used his now defunct Nike 3-wood to hit a beautiful shot to the front of the green and two-putted to make the birdie, which subsequently resulted in him winning the title outright, without need for a playoff. I have two tips for players that have the option of taking relief under the Rules; first, is not to lift your ball until you have determined exactly where the nearest point of relief is, as the permitted dropping area may be disadvantageous to where the ball is lying; and second, to try and drop your ball in such a way that it will require a re-drop and perhaps subsequent placeing of the ball after a similar re-drop, as this will obviously give you a better lie from which to make your next stroke. Playing in the amateur competition of the CareerBuilder Challenge in La Quinta, California, last week, Dave Colby had a hole-in-one on the par-3 17th hole, which won him a brand new Genesis G90 luxury sedan. For several years the USGA has allowed an amateur to win a valuable prize, such as a car, for making a hole-in-one in a round of golf, without forfeiting their amateur status, but those of us that play golf outside of USA and Mexico only received this exception when the Rules of Amateur Status were changed in this respect from 1st January 2012. Apart from this hole-in-one exception, the most valuable prize that any amateur golfer can win without losing their amateur status is US$750 / St£500, or the local currency equivalent. You will probably be aware that the Ruling Bodies are considering a major modernisation (simplification?) of the Rules of Golf. I will not be speculating on the unsubstantiated rumours that are arising, as I think that it can only cause confusion; I prefer to spend my time interpreting the Rules as they are, for the benefit of others. However, if you do want an idea of what is being leaked following a presentation made to some European Tour players last week then you can check out this link. I will not be engaging in any communication regarding this subject. It is time for Committees in the northern hemisphere to start planning for the upcoming season. Why not run a Rules night for your Club or Society? I have done all the work in my 'ready to run' quizzes (General, Juniors and Match Play). More information at this link. The quote from the player appears to have a reporter's error. "I can't drop it when I'm still stood on the path." I suspect the "when" should be "where". If I remember correctly, Tommy did not place the ball but played from where the last drop finished. You may be right, but Stephanie Wei, author of the excellent 'Wei Under Par' golf blog, who was in Abu Dhabi at the event, reported otherwise.